John Carnell Crosbie became the 12th Lieutenant Governor of Newfoundland and Labrador in February 2008 following a career in public life and the law. Crosbie's early education was in St. John's, NL, and Aurora, Ontario. He studied political science and economics at Queen's University in Kingston, Ontario and law at Dalhousie Law School in Halifax, Nova Scotia, graduating in 1956. During 1956-57 he undertook postgraduate studies at the Institute for Advanced Legal Studies of the University of London and the London School of Economics. He was called to the Newfoundland Bar in 1957. He was first elected to the House of Assembly in 1966 as a Liberal and joined the Cabinet of Premier Joseph R. Smallwood as Minister of Municipal Affairs and Housing. In 1967 he became Minister of Health, but resigned the following year over fundamental differences with the premier's economic policies. 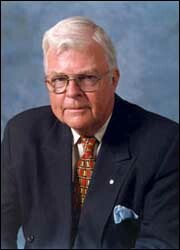 In 1971, Crosbie was re-elected to the House of Assembly as a Progressive Conservative, and until his move to federal politics in 1976, successively held numerous portfolios. From 1976 until his retirement from political life in 1993, he represented Newfoundland and Labrador's federal district of St. John's West and held several key portfolios in both the Clark and Mulroney administrations. As Minister for International Trade Crosbie was responsible for the Canada-U.S. Free Trade Agreement and its successor the US, Mexico, Canada or NAFTA Agreement. Later he had responsibility for Fisheries and Oceans and the Atlantic Canada Opportunities Agency, two portfolios, critical to the economy of Atlantic Canada. In 1994, following his retirement from federal politics, he was installed as Chancellor of Memorial University of Newfoundland and served in that position until becoming Lieutenant Governor in 2008. He has received many honours, most notably, Officer of the Order of Canada in 1998. He is the author of a political autobiography No Holds Barred published in 1997 by McClelland & Stewart Inc. This article is condensed version of the Lieutenant Governor's biography on the Government House web site.